During November the Cookbook Guru is cooking from the Australian Gourmet Traveller Magazine. I have already posted a potato and egg curry recipe which I loosely adapted to suit my diet, but in light of my recent post urging cooks to be mindful of the severe shortfall in recipe testing to which new books are subjected, I thought I’d share my critical analysis of a recipe from the magazine. In August this year I bookmarked the recipe for Spiced Hazelnut-Cacao Brownie from a section featuring sugars and spice. I had local hazelnuts and an open packet of cacao nibs languishing unloved in my fridge, so it seemed a good way to despatch them. I made my choice based entirely on the topping baked onto that brownie. The magazine’s full page photo looks very tempting! We follow a gluten free diet so the brownie itself is my loose adaptation of the one printed in the magazine, but I made other changes as well. The original recipe stipulated 250g chocolate, 200g of 65% and 50g of 70% cacao solids. My question is why? I interpreted this as 250g dark chocolate and used Lindt dark bittersweet with a cacao content of 58%, the chocolate I buy in bulk and have on hand for cooking. I reduced the massive 300g of expensive muscovado sugar to 200g of local brown sugar, and the plain wheat flour I converted to a combination of chestnut flour, hazelnut meal with a small amount of psyllium husks to give the cake strength. I don’t have a kitchen hand to clean up my cooking mess, so rather than melting the chocolate and butter in a double boiler as instructed I used a saucepan over low direct heat, stirring constantly and removing the pot from the heat the minute the butter was melted. The remainder of the chocolate melted in the residual heat, then the saucepan became my mixing bowl. It was a simple process. I followed the instructions and ingredients exactly for the topping, but struck a trap as soon as I began using a spoon to sprinkle it over the surface of the brownie. The small elements, the chilli and salt flakes had fallen into the bottom of the combined ingredients and the first spoonful I sprinkled was heavy with chilli and salt. I would have been better to sprinkle each element individually to get an even distribution. The baking of the slice was routine and went pretty much according to the instructions. I cooled the slice in the tin, then transferred it to an airtight container overnight. With camera and props ready for the finished product shots in the soft morning light, I heated my 25cm long cooks knife so I could make a clean cut through the brownie slice with a single action, but the large pieces of toasted hazelnut offered quite a bit of resistance to the razor sharp blade and my clean cuts became ragged. I should have anticipated this outcome, and in fact, close scrutiny of the full page photo in the magazine reveals where nuts were removed to give the knife clear passage. I know this is a minor issue really, but after years of working in a caterers kitchen where the expectation is that baked goods look perfect, it rankles! It was a fine tasting brownie, but not outstanding or special, although it did seem to improve after a day or two. I suspect the chilli and the salt were added as a trendy after thought. The subtle cinnamon flavour is delicious but I found the chilli and salt superfluous. If I had gone to buy the ingredients specifically to bake this brownie I would have been outraged at the cost, it was a very indulgent treat. Would I make it again? No, I would make Celia’s GF Chestnut Flour Brownies or Nigella Lawson’s GF Almond Meal Brownie. Grease a 22cm X 25cm slab tin and line it with baking paper. Preheat the oven to 160C. Measure and prepare the topping ingredients and place then separately on a plate. Set aside. In a large saucepan over a low heat, melt the butter and chocolate, stirring gently to prevent the chocolate from overheating on the bottom of the pan. Remove the chocolate from the heat and stir in the sugar. Add the eggs one at a time, stirring thoroughly to combine. Mix the dry ingredients thoroughly with a wire whisk then stir them into the chocolate mixture and mix lightly until combined. Tip the batter into the prepared slab tin, spread it to the corners of the tin and smooth the top surface. Sprinkle over the topping ingredients one by one. Bake the brownie until it feels firm and a toothpick comes out clean when inserted into the centre, about 45 minutes. Cut into 20 squares and store in an airtight container. What an exotic brownie. I’m sorry it didn’t live up to expectations but it’s good that you tried it so you weren’t left wondering. What are psyllium husks and in what way do they add strength? Is it flavour of texture? How intriguing! I understand completely about the difficulty of getting a perfect shot – those pesky nuts getting in the way of a clean slice. It’s the sort of thing non-foodies just don’t think about when they look at a food photo. If it helps, I think your picture is beautiful and utterly edible!! I seem to be catching up with your posts- some were not landing in the right ‘boxes’. This is a very sensible approach to substituting sensible ingredients and better method. I was hoping to do a post on Gourmet Traveller for Leah’s Cookbook Guru, but am very disappointed in the current edition. It seems full of ads and rather silly recipes. I have a huge wall of back issues though- some of the older years seem better. I was thinking of posting a rave about the demise of Gourmet Traveller instead! Another trick I have noticed with magazines and some food bloggers is that they photograph the dish when it is still raw, to make the colours more vibrant and the ingredients more perky. I agree with you re the current AGT, ads and silly recipes! Waste of both time and effort IMO! Have a rant, I’m sure you’ll have a host of supporters. Smoke and mirrors are a huge part of our dumbed down media, all sectors sadly. I fear for the future of the virtues of honesty and credibility. I’ve just bought my first ever bag of cacao nibs (I know… I’m WAY behind the times! ), so I’m on the hunt for fab recipes to use them in. These brownies look wonderful, though interesting to hear how you’ve modified them and what you would change if making again. Love an honest critique! Thanks Margot. I loved just munching on cacao nibs, way too yummy! Thanks they were pretty good! Great recipe review. Espresso powder is a better addition to brownies than chili. Interesting mixture of chestnut flour and hazelnut meal – both strong flavours. I’m with you, however. I love Celia’s chestnut flour brownies. I also wonder what Nigella’s GF brownies would be like if one switched hazelnut meal for the almond meal. Hazelnut and chocolate is a marriage made in heaven. Sounds like you also experienced what David Lebovitz calls the QCSSS (“Quarter-Cup of Squab Stock Syndrome”) when you buy outrageously expensive or one-off odd ingredients for a single recipe. Note: you can probably tell I’ve been reading a lot of Lebovitz lately. Very funny man – and amazing recipes! I bet he has a good GF brownie. I also follow him on Facebook. Cacao anything is so good! 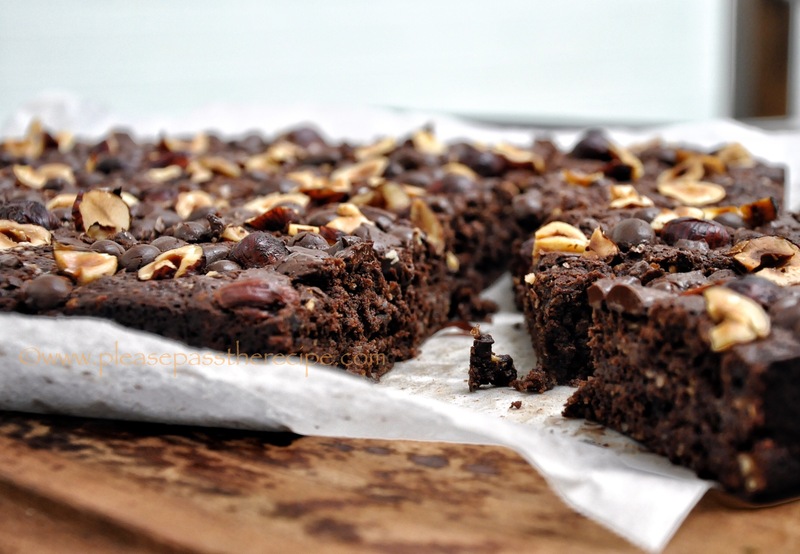 This entry was posted on November 18, 2014 by ladyredspecs in Baking, Cakes, Chocolate, Desserts, FODMAP diet, Food, Gluten Free, Gluten free baking, Slices and Tray Bakes, Sweet mouthfuls, The Cookbook Guru and tagged Baking, brownie, chocolate, cookbook guru, FODMAP diet, gluten free.